The play also had a production in 1949 at London's Prince of Wales Theatre starring Sid Field then, after Field's death, Leslie Henson, and at Paris' théâtre Antoine, staged by Marcel Achard in 1950. Elwood P. Dowd is an affable man who claims to have an unseen (and presumably imaginary) friend Harvey — whom Elwood describes as a six-foot, three-and-one-half-inch tall pooka resembling an anthropomorphic rabbit. Elwood introduces Harvey to everyone he meets. His social-climbing sister, Veta, increasingly finds his eccentric behavior embarrassing. She decides to have him committed to a sanitarium. When they arrive at the sanitarium, a comedy of errors ensues. The young, handsome, and very flirtatious Dr. Sanderson commits Veta instead of Elwood, but when the truth comes out, the search is on for Elwood and his invisible companion. When Elwood shows up at the sanitarium looking for his lost friend Harvey, it seems that the mild-mannered Elwood's delusion has had a strange influence on the staff, including sanitarium director Dr. Chumley. Only just before Elwood is to be given an injection that will make him into a "perfectly normal human being, and you know what bastards they are!" (in the words of a taxi cab driver who has become involved in the proceedings) does Veta realize that she would rather have Elwood the same as he has always been — carefree and kind — even if it means living with Harvey. The only character to appear in all scenes is Elwood P. Dowd. The play was adapted for film by Chase, Oscar Brodney, and Myles Connolly in 1950. Directed by Henry Koster, it starred Josephine Hull and James Stewart. In addition, versions of the play were produced in 1959, 1967, 1970 (with Heinz Rühmann) and 1985 for West German television, as Mein Freund Harvey (My Friend Harvey). ↑ "Harvey". Internet Broadway Database. Retrieved 2015-11-24. ↑ "Harvey". Playbill Vault. Playbill. Retrieved 2015-11-24. ↑ "Prince of Wales Theatre London". Thisistheatre.com. Retrieved 30 April 2015. ↑ Catholic Herald archive, catholicherald.co.uk; accessed January 1, 2013. ↑ "Harvey to return to West End starring James Dreyfus?". West End Theatre.com. West End Theatre.com. Retrieved 30 April 2015. ↑ Jones, Kenneth. "Harvey, Starring Jim Parsons in Classic Hare-Raising Tale, Begins Broadway Run", playbill.com, May 18, 2012. 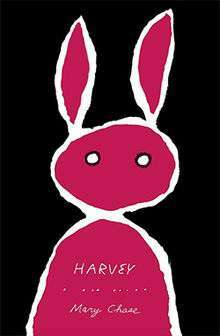 ↑ Harvey at Theatre Royal Haymarket in London. Accessed 21 March 2015. ↑ Lowry, Brian (2009-08-02). "BFDealmemo". Weblogs.variety.com. Archived from the original on January 30, 2010. Retrieved 2010-07-06. ↑ IMDb reference to Spielberg's Harvey; accessed May 27, 2014. ↑ "Harvey". Curtain Critic. Retrieved June 21, 2012.